The EMU basketball women looked fresh and rested today in their 76-43 win over non-conference opponent Mary Baldwin on Saturday. This was the first game in two weeks for the women who have now won their third game in a row to improve to 5-7 heading into January. From here on out it is all conference opponents slated for the Royals beginning with taking on Roanoke in Yoder Arena on Wednesday, January 2 at 5:00pm. Mary Baldwin jumped out to an early 9-3 lead to begin the first quarter before the Royals responded with eight points capped by an Emily McCombs (Culpeper, Va./Eastern View) layup. The teams battled out the first quarter to finish tied at 17. The second quarter was dominated by EMU who outscored the Fighting Squirrels 18-2 in the quarter. Jess Washington (Chesapeake, Va./Great Bridge) made a layup at the 0:49 mark in the first quarter to begin a 23-2 run for the Royals that spanned until 9:44 in the third quarter which made the difference in the game. Washington scored seven of her ten total points during that run to lead the offense. The score was 35-19 at the start of the second half. EMU continued to put pressure on Mary Baldwin as a made three-pointer by Chrissy Delawder (Broadway, Va./Broadway) increased their lead to 20 at the end of the quarter. The Royals turned to their bench in the fourth quarter to push towards the finish line. Constance Komara (Harrisonburg, Va./Harrisonburg) scored all seven of her points in the last two minutes of the game and Amber Wooldridge (Winchester, Va./James Wood) made a highly contest three that gave the entire Royals bench some excitement as the game was coming to a close. 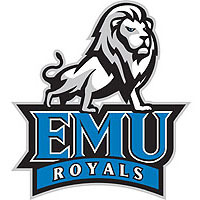 Lexi Dean (Elkton, Va./East Rockingham) led the Royals with 14 points coming off the bench. McCombs finished the game with 13 points and Delawder had eight rebounds to go along with her five points. EMU shot 43.5% (27-62) from the floor and 39.1% (9-23) from three while Mary Baldwin shot 30.0% (18-60) and 12.5% (2-16) behind the arc. The Fighting Squirrels were led by Leah Calhoun who had nine points and eight rebounds.